To have a garden is to be regularly reminded about death. As I was clearing away the stalks of hemp agrimony last spring, I found the frail, headless corpse of a male blackbird, its decapitation a strong indication that it had been brought down by a sparrowhawk. It weighed heavily in my hand, for I knew this particular bird. At twilight he would cling on to next door’s rooftop television aerial and and pour out his mellifluous song, the notes trickling down like honey. Later, there might be some kind of upset in the bushes, and his maniacal alarm call would set off everybody else. But he was also subtle. I once walked past him in semi-darkness as he sat in the lilac bush, and heard him making a soft ticking call, like a feathered clock. Apparently this call is used to deter other males from roosting in the blackbird’s territory overnight, but it sounded to me as if he was trying to comfort himself, like a lone child whistling in the dark. And then, after his death, there was a year without blackbirds and darkness fell without serenade. But this year, they are back, in force. There is at least one adult male, a female, and a young male. The young males have a charcoal black and dark brown livery in their first year, and this chap is regularly seen off by the adult male. But the youngster is determined, and I often see him sitting in the whitebeam tree, shuffling his feathers and looking around anxiously. Although blackbirds are ostensibly monogamous, and mate for life, a study has shown that up to 17% of offspring are not fathered by the female’s partner, so maybe the youngster is just waiting for his chance. The garden is the adult male’s territory, and in the morning I often see him picking over the patio, or throwing leaves aside in a search for little insects and other titbits. His beak is as orange-yellow as a crocus, and this colour is thought to be an indication of dominance and health: in experiments, male blackbirds react more strongly to orange beaks than to yellow ones, and are largely indifferent to the black bills of first year males. Someone should tell my blackbird that he’s meant to leave the young guys alone. At any rate, only his mate is tolerated: as soon as he sees another blackbird, the male bows, fluffs himself out, sometimes lets out a semi-hysterical cackling war cry and flies directly at the offending bird. He seems to spend a large proportion of his time in this way. I hope he has the energy left for child-rearing later in the year. I wonder about the female, too. Blackbirds mate for life, but it could be that she has taken up with this dashing gallant following the death of her previous partner. On the other hand, as blackbirds try to hold the same territory for life, and I saw no blackbirds at all for a year after the death of the male, this could be a completely new pair. The female spends a lot of her time feeding at the moment – egg-laying and chick-rearing is highly expensive in terms of energy, and she’ll need every morsel she can find. Plus, she builds the nest by herself, sometimes in thick undergrowth, sometimes in a shed, sometimes in the most unlikely places, such as a pair of unloved wellington boots or, as I once saw on Orkney, in the radiator grille of an abandoned car. They sometimes seem a bit clueless in the spots that they choose, and many, many nests fail due to predation. Mind you, round here you’d need a gun emplacement and barbed wire to keep the cats out, so any chicks that get to the fledging stage are doing well. 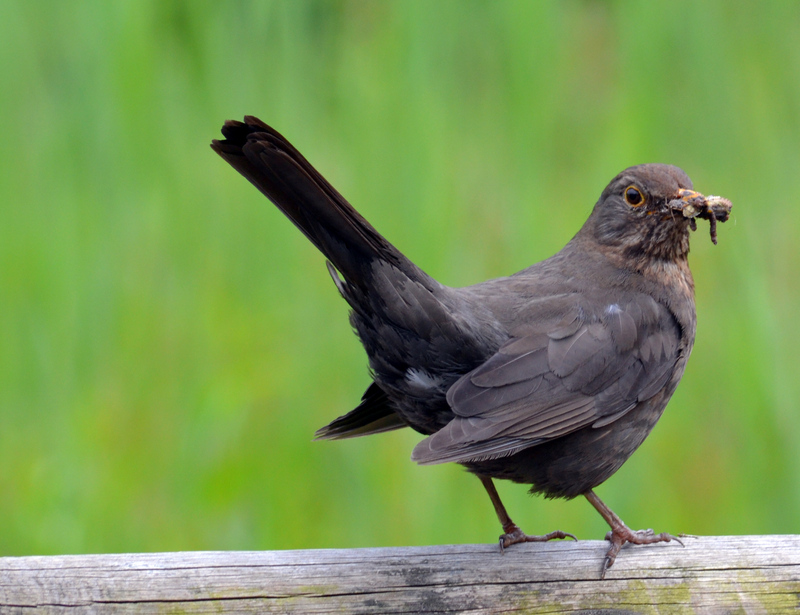 Blackbirds apparently have different alarm calls for cats ( a ‘chook-chook-chook’ call) and for aerial predators like the sparrowhawk (a ‘seeeee’ call which is difficult to locate). The last three crab apples just about to disappear…. 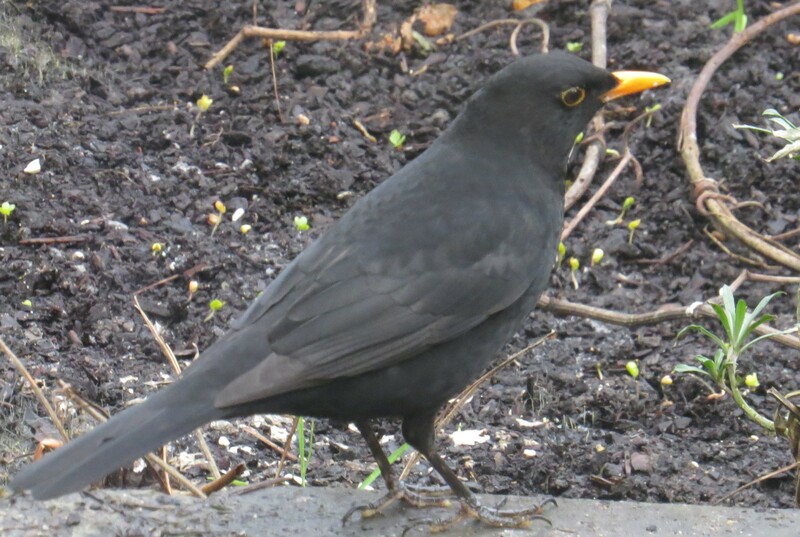 Blackbirds are ground feeders – I occasionally see the male perched cockily on my bird table, but they can’t manage the other feeders. They do love berries, however, and work their way through the haws and the hips with great enthusiasm. 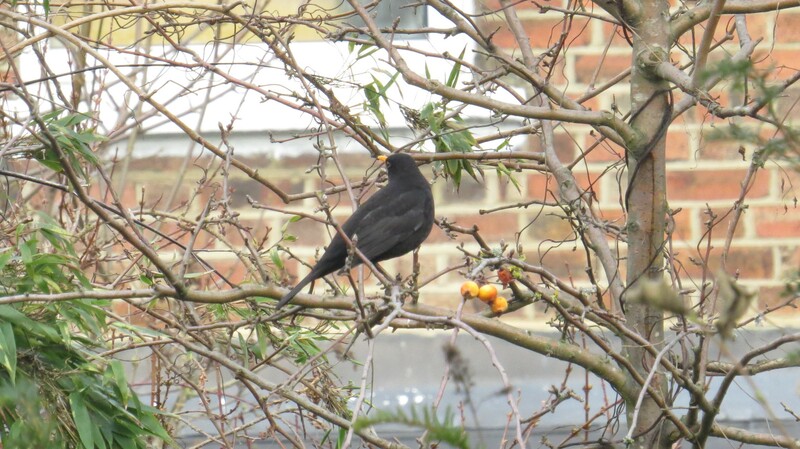 As I was watching today, the male ate the last of the crab apples, but these are not favourites: sweet and juicy fruit is much preferred, not just by blackbirds but by most thrushes. I once put out some grated apple for a fieldfare who had been downed during a snowstorm, and it was much appreciated. I often throw out apples and pears that are past their best – once they’re all brown and bruised they’re ideal thrush food. Because blackbirds were (and still are) so common, they would have been a handy addition to the diet in hard times, but the pie here sounds like a more extravagant affair. Just as married couples sometimes release doves or butterflies at their nuptials, so there was a fashion for slapping a pie crust on top of some cowering birds so that they would burst forth when the lid was cut. I only hope that the blackbirds made their way towards the sky and escaped. 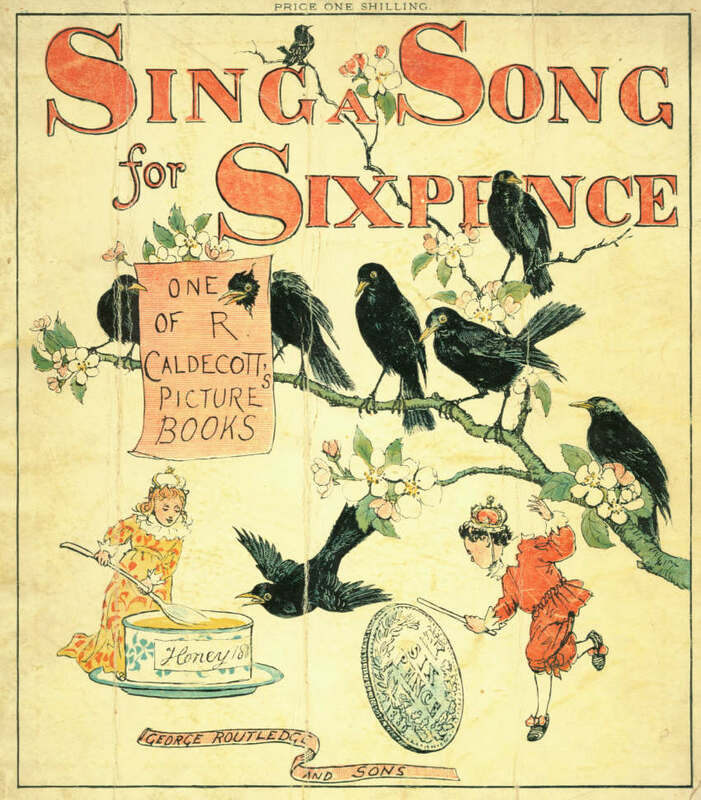 Incidentally, the ‘four calling birds’ of The Twelve Days of Christmas probably refers to ‘Colly (Coaly) birds’, i.e. blackbirds. A flock of starlings rolled overhead, on their way to their roost in one of the big plane trees on the High Road, and the last twitterings of a charm of goldfinches faded into silence. And I thought about blackbirds, and their short, unremarked lives, and the struggles, both human and animal, that surround us everyday. But also the joy. We must never forget the joy. This entry was posted in London Birds on February 18, 2017 by Bug Woman. Can’t resist adding to the poetry refs Emily Dickinson’s ‘A bird came down the walk’. Have always thought that the bird-behaviour she describes sounds like a blackbird’s. 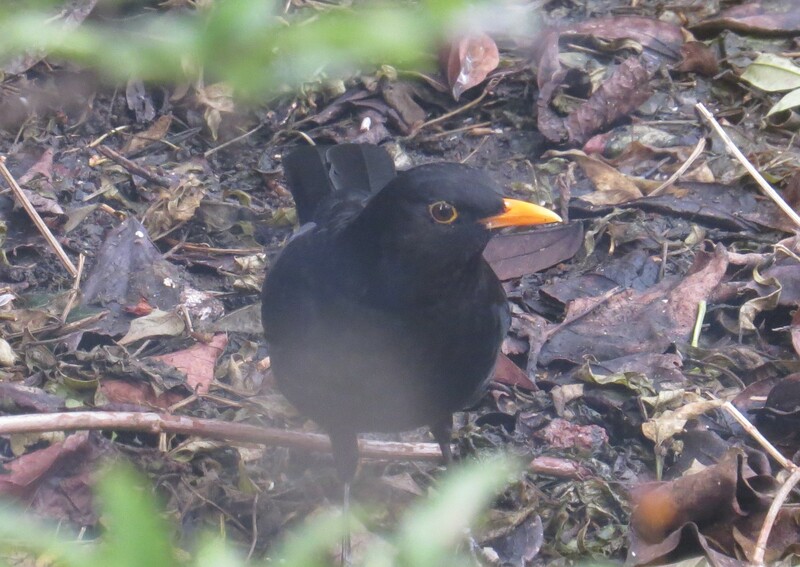 I think there might be a blackbird poetry post at some point in the future – there’s Wallace Stevens’ ‘Thirteen Ways of Looking at a Blackbird’, Tennyson had ‘The Blackbird’ and Seamus Heaney did a wonderful thing about St Kevin with his hands out of the chapel window and a blackbird nesting on them…..thanks for another one! Beautiful Vivienne, I always associate blackbirds with rain, as I love the way they seem to sing just before a rainstorm and their song pierces the stillness. I love Blackbirds, their song is so beautiful! Sadly I don’t see many where I live but of a summer, I do hear them of an evening! Thank you for the reminder of the Shakespeare, Gert. How do you tell the difference between a young male and a female? I now realise that many of the ‘female’ blackbirds I have been watching may have been males! 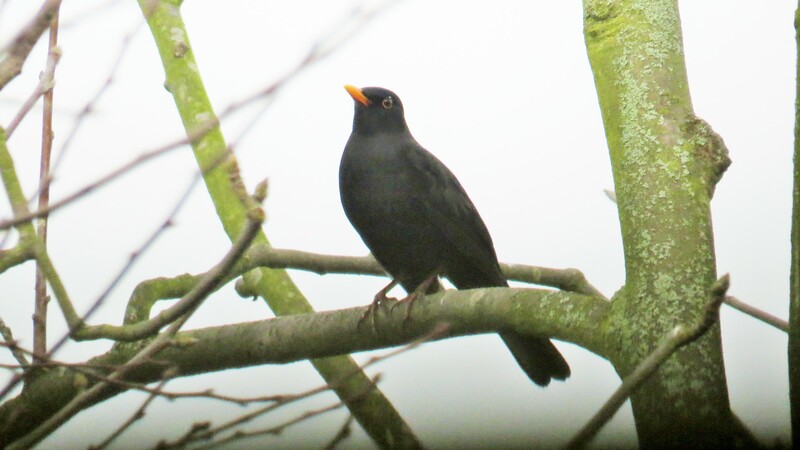 I too love the song of the blackbird, and last evening heard one duetting with my neighbour’s clarinet – beautiful. We seem to have nothing but Blackbirds again this year though last year they were few and far between. I so rarely see any females, but there must, surely, be some about? I’ve only just discovered your blog through ‘Spitalfields Life’. I have to tell you how much I’ve enjoyed reading it and learning about the natural world in your part of the world. Thank you. I have had blackbirds in my garden ever since I moved in in 1991. I didn’t realise they mated for life so I was pleased to learn this. I find they can be quite aggressive to other ground feeding birds and often attempt to run at them and chase them away. I’d never thought of leaving pears out for them but I will now! Hi Veronica, welcome to the blog, and I’m glad that you’re enjoying it. 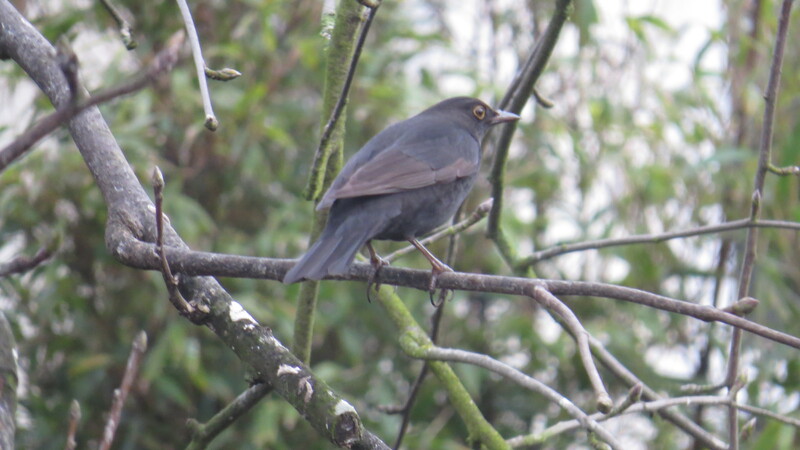 Yes, blackbirds can be rather bolshy, but when we had a stranded fieldfare in the garden a few years ago he was much, much worse – all the other birds cowered in the undergrowth until he moved on! Thank you for yet another exquisite entry—but they are all exquisite! “To have a garden is to be regularly reminded about death” is a wonderfully apt reminder, an essential “memento mori”. I am sorry that you lost your previous blackbird friend. Your ode to him is lovely. Thank you, Gubbinal, I’m so glad you’re enjoying the blog….